The Philippines is an archipelago of 7,107 islands in South East Asia. It lies to the north of Indonesia and to the east of Vietnam. The islands have a population of 84,765,000 people across an area of 300, 000 km2. A former Spanish colony, the country is predominantly Roman Catholic and its currency is the Philippine peso. Filipino and English are the main languages spoken in the Philippines, but there are a vast number of dialects and minority languages also spoken throughout the islands, estimated at 125 to 170 languages. What can I send to Philippines? What items are restricted? If you are drawn to the stunning beaches of the Philippines, if you intend to enjoy multiple spa treatments, if you would love to trek the beautiful landscapes, or if you want to spend your time in the Philippines on a shopping spree, Send My Bag can help make your trip a whole lot easier by shipping your bags to and from your destination. With great flat rates for a massive 30 kg, you can send plenty of clothes and sporting equipment to see you through your holiday. You can also shop to your heart’s content and ship your purchases home. By doing so you will avoid queuing at bag drop or luggage carousels and you can hop on and off public transport without dragging luggage behind you. If you are in the Philippines on a more permanent basis ‒ if you are moving there to live or to study at one of the local universities ‒ Send My Bag can ship your possessions for you. This will allow you to settle into your new home or student accommodation straight away. You can send your luggage and boxes to the Philippines with Send My Bag. If you are going on a gap year in the Philippines, if you are working there for a summer, or are moving there permanently, you can save yourself a lot of stress and hassle by sending your possessions with Send My Bag. Your possessions will be looked after for you, saving you the hassle of dragging them with you on your journey. Send My Bag has numerous international routes, with an excellent value flat rate for each route up to a massive 30 kg. This means that you can bring all your favourite things with you to help you set up home abroad. To learn more about sending luggage to the Philippines, visit our ‘How it works’ page, or our ‘FAQs’. Golf is popular in the Philippines, which has just short of 100 golf courses. This makes the country a great golfing holiday destination. It’s easy to use your own golf clubs while on holiday in the Philippines but without the hassle of dragging them through airports with you. You can send your golf clubs to the Philippines with Send My Bag. This means you will avoid any oversized baggage fees from your airline. Make sure you find out how best to package your golf clubs by visiting Send My Bag's information on how to ship golf clubs. See regions of the Philippines that most tourists don’t get to by exploring the country by bike. Don’t worry about having to hire or buy a bike when you are there. You can just use your own bike by shipping it to the Philippines with Send My Bag. Sending your bike to the Philippines couldn’t be easier. Check out our bike shipping section to find out how to send your bike, including how to package it appropriately. If you send your bike you will avoid oversized baggage fees and won't have to carry the bike to and from the airport. If you are attracted by the thought of living in the Philippines and have decided to take the plunge, you will have to consider international removals to the Philippines in order to transport all of your possessions. Just take extra care to carefully package all of your items so that they won’t get damaged in transit. Use suitable packaging for your items and seal everything up well. The Philippines has one of the best higher education systems in Asia, with many top-ranking universities, such as the University of the Philippines, De La Salle University and the University of Santo Tomas. If you have decided to complete your studies in the Philippines as an international student, Send My Bag has just the service you need. Send My Bag can ship your possessions – books, clothes, etc. ? to your student accommodation in the Philippines, allowing you to get stuck into your studies and enjoying life in your new home. Find out more about student removals with Send My Bag here. You can also send a parcel to the Philippines with Send My Bag. This is a great idea if you have left something behind at home. A friend or family member can pop it in a box and send it on to you. Or they might want to send you a care package to the Philippines to help remind you of home, or even Christmas and birthday presents. Take a look at our parcel shipping page to learn about choosing a suitable box for your items and sealing the box up appropriately. You could send big bulky items to the Philippines using air freight, which usually takes one to two days. You will have to pay more as the size of your shipment increases. Plus, you will have to pay for the services of a customs agent to handle customs clearance for you and to get your items to and from the airport. Costs could, therefore, quickly mount up. If you send internationally by air freight to the Philippines your items will likely arrive at one of the major airports, such as Ninoy Aquino, Iloilo or Francisco Bangoy. You could go for sea freight or container shipping to transport your possessions, such as a bed or a snooker table, to the Philippines. Although much slower, it can be less expensive than air freight, but you will still need to use the services of a customs agent and will need to sort out how to get your items to and from the ports. So, the cost could be more than expected. 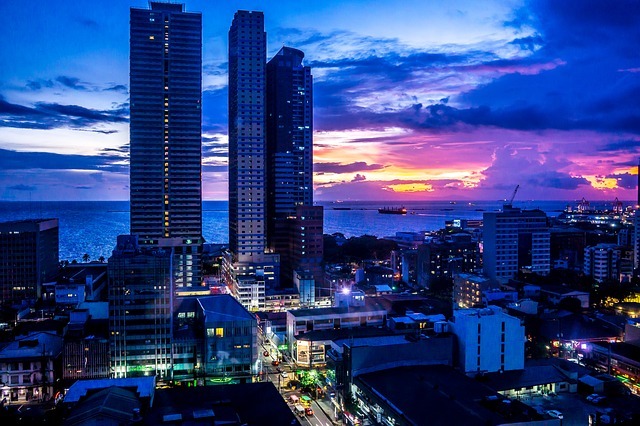 When using container shipping to the Philippines your items will most likely arrive by ship at one of the major sea ports, such as Manila, Cebu or General Santos. I shipped a box containing my personal items and mail from the USA to Philippines and it arrived in only 4 days. My only issue is that the shipping guidelines are somewhat strict, but overall the costs are lower than using the regular mails or other express services. 2nd use, will be back again! Fast ship. Easy pick-up. Arrived damage free. Doesn't get any better right? The climate of the Philippines is fairly moderate throughout the year, with an average yearly temperature of 26.6°C. The islands suffer serious storms, however, usually between July and October. There are many different reasons for visiting the Philippines. You can take in its luscious landscapes and diverse wildlife, enjoy a beach holiday on its stunning white-sand beaches, enjoy pampering treatments at spas, go shopping in some of the world’s largest malls, or enjoy outdoor activities such as diving, snorkelling, kayaking, canoeing, windsurfing and golf. Among the beautiful landscapes of the Philippines are the rice terraces of the Philippine Cordilleras, a UNESCO World Heritage Site. Beaches to enjoy include White Beach in Boracay – one of the most well-known in the Philippines and rated as one of the top ten beaches in the world. Three of the ten largest shopping malls in the world are in the Philippines: SM Megamall, SM North Edsa and SM Mall of Asia, making the Philippines a shopper’s paradise. This is compounded by the fact that the Philippines is a cheap place to shop, with things like rum being even cheaper than fruit juice. Spa treatments are also excellent value, with full-body massages costing only 350 pesos (or 8 US dollars) in some places.